From mac and cheese to hearty chilis! Camping might be a summer pastime, but sitting close to an open fire and cuddling up with some warm food makes the most sense during fall. If you're brave enough to do some autumn camping this season, we all know cooking time is limited. 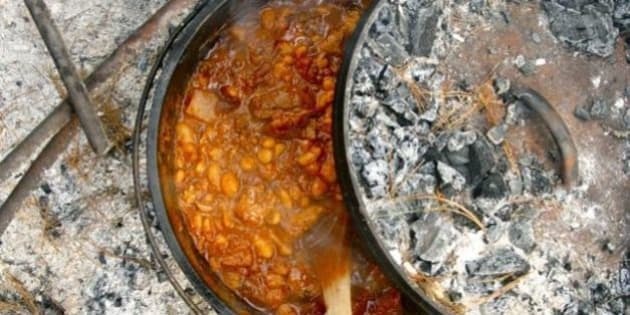 While other campfire foods like burgers and tacos might make sense when it's hot outside, for fall camping, you want to stick to fewer ingredients and simpler meals. For fall, we suggest one-pot recipes like soup, stews and chilis (the perfect comfort food), or things you can make ahead at home, like tin foil dinner packets or Dutch oven desserts. Below, we've rounded up our favourite fall camping recipes from a baked mac and cheese to loaded potatoes with bacon to the perfect vegetarian black bean chili. Check them out below and let us know, what do you make over the fire during fall?